BassAceGold rilascia la seconda versione (revisione 9) di BAGPlug, nuovo plugin per la DSTWO. if a new file is added to your favorites (This is not a bug, it prevents lag in folders with lots of files). 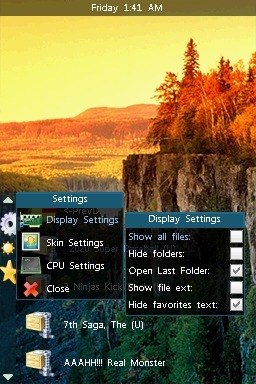 -added EOS Settings for roms, (press select on a commercial rom or Y in favorites). This lets you switch between clean/patch mode, turn cheats on/off and select one of the multi saves. -enterLastDirWhenBoot in the globalsettings.ini is now set to 1 when launching a rom, auto run in the DSTwo menu requires it set to 1.